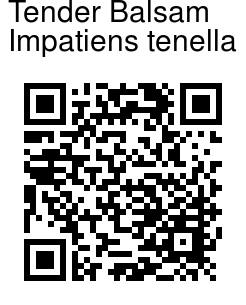 Synonyms: Impatiens debilis Turcz., Balsamina rosmarinifolia (Retz.) DC. Tender Balsam is an annual erect herb, slender, hairless, with stems sparingly branched. Leaves are stalkless or shortly leaf-stalked, opposite, oblong or lanceshaped, remotely sawtoothed, 2.5-11 cm long; stipules absent. Flowers are borne singly or fascicled, pink; flower-stalks capillary, erect, horizontal or deflexed in fruit. Lateral sepals are linear, tapering. Standard short. Wings stalkless or shortly stipitate; distal lobes of wings clawed, elongate; basal ones small; dorsal ear small, straight or decurved. Spur is shorter than flowers. Capsules are club-shaped, pointed, straight, long-beaked, about 1 cm long; seeds few, round, compressed, shining black. 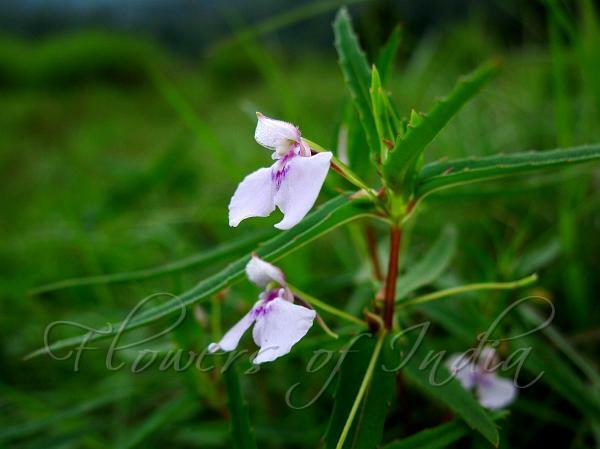 Tender Balsam is endemic to Southern Western Ghats, found in Karnataka and Kerala.